Slowly the bedroom is taking shape. The clay paint has been applied and now the floor has the first coat of Volvox Hard Oil Wax finish applied and is drying. It is applied with a scraper at the rate of 20ml per square metre. We used a whole 300ml to coat the floor this morning applying volvox with a scraper and used a little more to coat the skirting, window surrounds, architraves etc. Looks great. Using the buffer to first sand the floor then to buff the Volvox was fun but hard to keep under control. The floor is now done and the skirting has been put back. The whole floor, architraves, skirting and window surrounds used approx 800mls of the Volvox Hard Oil Wax and looks fantastic. The door has been stripped back and has been rehung. It looks pretty yuk but we have plans for that. I repainted the window frames with Volvox Pro Aqua Enamel. A water based natural paint. It goes on very thinly but it seems to streak when applied over previous paint even though we sanded and washed the original paint well and sanded between coats. I am going to try Bio natural paint next room we renovate as it is substantially cheaper than Volvox. I was researching Volvox when I came across your post. I noticed it is 3 years since you talked about using Volvox. I am looking at using a greener floor product for our renovation too – can you tell me how the Volvox hard oil wax has lasted for you – are you still pleased you used it? http://www.michelesrenovationdiary.com Thank you. Yes we are very happy with the product. 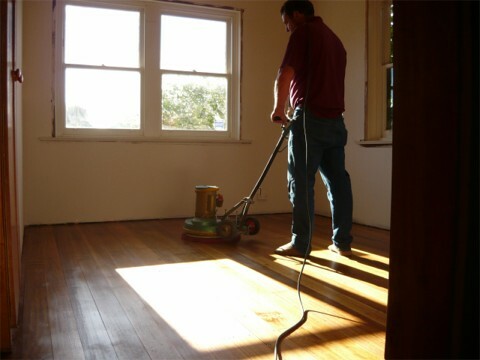 We are still using it as we continue to sand floors and renovate. It is hardwearing, easy to apply and easy to fix if there is any damage. Just sand and apply a couple of coats on the damaged area. It is a little lighter where you repair it. Note that I have only had to do that in one spot. We use a sacrificial wax coat over the top in the high traffic areas about once a year to eighteen months. Use a mix of Carnubra wax and pure turpentine. Apply and buff off. I’m similarly curious as to how you found the Volvox Pro-Aqua enamel. If you continued using it, how is it holding up? Did you ever end up trying the Bio Enamel? Thanks from Damien in Hobart. Your floor looks great guys. I’ve got the sander-man coming today to do our kitchen and hall floors. Tomorrow i’ll crack open the tins of Hard Wax Oil and get stuck into the next phase. I’m curious though: did you find it difficult to stick to the 20ml/sq metre recommendation? I’m planning to use an old (but clean) 10ml syringe to get the product across the requisite area and then use the taping knife to move it around. 2nd query: did you use a red pad on the buffing/polishing machine? Any issues with getting a uniform finish to the floor? Any hints or tips that you’d be able to pass on? What I did with the hard wax oil was to pour about 100ml into a plastic measuring jug and then pour some of that in a line along the floor. I then used a 200mm plastic scraper normally used for applying finishing coat on plaster board joins (equivalent to a taping knife) to move it about. As you scrape it it soaks in a little and the excess keeps on moving with the scraper. The trick is to have no excess on the surface when you have finished an area. If you do it dries to an hard waxy residue tha is hard to remove. Along the edges of the room can be hardest as there might be dust and particles that hide under the skirting. We took our skirting off to remove the paint and the plaster and dust did collect in the space between the plaster on the wall and the floor. 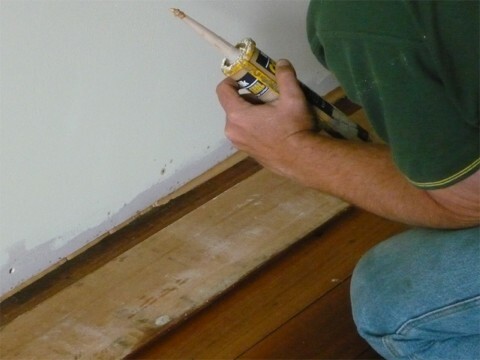 Where you might use more than the 20ml per square meter is if there are gaps in your boards. As you scrape it tends to go down the cracks. We used the red buffing pad. The instructions from Volvox say in one place to use the red one and in another to use a white one. The red one is coarser. What I found was to apply the Hard Wax Oil on an area that you can easily reach all over with the buffing machine (We found about 1-1.5 meters wide by the width of the room), leave it for about ten minutes and then give it a buff with the buffing machine. All this does is remove surplus Hard Wax. If you have a supply of absorbent rags on hand you can use them to remove excess oil off the buffing pad because when it picks up too much Hard Wax Oil it starts flinging it out of the sides of the buffing machine. Once the floor has been coated and buffed the first time we left it for approx 12 hours and repeated the process. After that we left it to dry. We tried to leave it for as long as possible (about a week)before laying down a sacrificial wax coat made from Feast & Watson Carnubra wax mixed with pure turpentine. Apply with a soft cloth, let dry (very fast) and then polish with more soft cloths or a buffing machine with a white pad. If you have kids, tie cloths to their feet and get them dancing. It all dries to give a soft lustrous finish, unlike the hard looking polyurethane finishes. We have had it in one bedroom since early December and it looking good. Hope this helps, please contact agin if you require more info. Oooh Err! You two have been busy!